The song might say ‘everybody needs good neighbours’, but Mid Sussex has been accused by Crawley of being a bad neighbour. During a Q&A with residents at Crawley Civic Hall last week, members of a panel which included councillors and police, were asked for their views on a traveller site planned for Lower Hollow Copse, in Copthorne. The site is on the border between the two authorities. Planning permission was granted by Mid Sussex District Council last month. 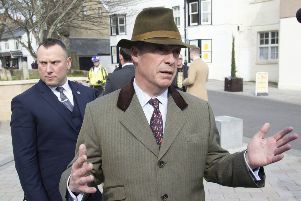 Stressing that there should be no prejudice against any groups and ‘travellers have a right to have somewhere where they can park up’, he added: “It does feel like whenever Mid Sussex feel uncomfortable about something, that we’re the first point of call. Garry Wall, leader of Mid Sussex District Council, said: 'I'm astonished that a leader of a neighbouring authority, and an experienced local politician, would�make such a remark." When asked about Mr Lamb’s comments, Garry Wall, leader of Mid Sussex District Council, was less than impressed, saying more than 160 potential sites had been looked at before Copthorne was chosen. Mr Wall said: “I’m astonished that a leader of a neighbouring authority, and an experienced local politician, would make such a remark. “He’s fully aware of the legal planning framework that exists and its only right and proper that we cater for the needs of everyone in our society. “Mid Sussex District Council is required by law to meet the accommodation needs of everyone living in the area and this includes gypsies and travellers. Duncan Crow (Con, Furnace Green) said Mr Lamb was being ‘a tad unfair’ and pointed out that there were other traveller sites all over the county and ‘most people aren’t even aware of them because they don’t cause any issues’. When Mr Lamb said that he was also talking about housing being built on Crawley’s borders, Mr Crow said he understood the concerns residents had but ‘there’s not a lot we can do about it’. He added: “All our neighbours have put housing on our borders because our neighbours are short of land as well. Mr Lamb reminded the meeting that Crawley was the most densely built place in the county, while Mid Sussex and Horsham were blessed with miles of green space. Referring to a development of 600 homes being built at Pease Pottage, which the entire council opposed, he said: “The problem is often that housing is unsuitable for the town’s needs.